If you are looking for a little inspiration, watch the video below which tells unique story of caddie Anil Mane and his dream to someday become a pro golfer. Narrated by his sponsor, venture capitalist Ashish Kacholia, the video captures the dichotomy between the ‘haves’ and the ‘have-nots’ in modern India. A putter made from rebar? Amazing. If you liked the documentary, you’ll enjoy this photo essay of golfers in the mumbai slums by Tomasz Gudzowaty, which served as the inspiration for the video. Our thanks to our friends at 72strokes.com for turning us on to this video. The Legend Golf & Safari Resort in South Africa – a place to combine your enthusiasm for wildlife and the majestic game – has never failed to take golf to the next level. This 18-hole course is designed by 18 different golf stars, including Padraig Harrington, Colin Montgomerie, KJ Choi, Retief Goosen, Justin Rose, Trevor Immelman and Vijay Singh. The Resort also includes privately owned homes, a golf academy, a driving range, a hotel, recreational facilities, a wellness centre, a “Field of Legends” sporting complex and a multi-functional conference centre. The course’s main attraction, however, is its optional 19th hole which is otherwise named the “Xtreme 19th”. This 630-meter (~700 yard) par 3 is the world’s longest par 3. 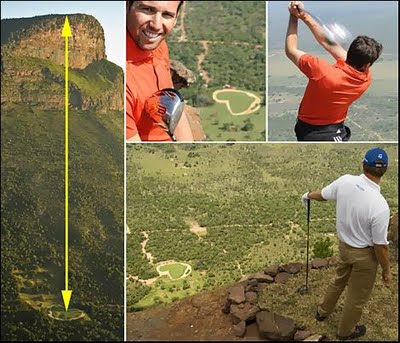 To play the hole, golfers must tee off from the top of the Hanglip Mountain, which is a quarter mile above the African continent shaped green. Once you tee off, it nearly takes 30 seconds for the ball to hit the ground. By the time it reaches the green, the ball is traveling at such a high velocity that your caddy will need more than a shovel to repair your ball mark. Playing the Xtreme 19th alone will cost you US$ 385, though included in the price is the helicopter ride, a bunch of souvenirs and a DVD of your shot. But you can make that back and more, as the resort comes with a promise of an astonishing $ 1 million prize for a hole-in-one. Though no one has yet been lucky enough to win it, the ability to play a round at this beautiful resort is by itself a unique and wonderful prize. Tee off towards the whites! There may be many stunning golf courses throughout the world, but the Ice Golf course in Uummannaq, Greenland stands a step ahead. Uummannnaq, the coldest course in the world, is located 600 km north of the Arctic Circle and since 1997 has been the home to the World Ice Golf Championship. One of our goals for 2011 is to bring you relevant and interesting posts about the handicap, improving your game, and the world of golf around you. 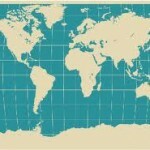 To start the year off, we are launching a new series Golf Around the World by our contributor M.S. Greene highlighting some of the more interesting courses you may not know about. We’ll be producing a Scorecard as well – if you’ve played more than a quarter of these courses, you should consider yourself a true explorer of the golf world! If you are an amateur golf blogger and have an interest in posting to our blog, send us an email with a link to your work. We’re always looking for posts that will help enlighten and entertain our members.